Nabisco is a big fan of releasing unusual flavors of Oreos every so often. Back in the fall, there was speculation that a new limited edition Peeps-flavored Oreo would be coming out soon. Naturally, the Internet freaked out. With spring just around the corner, it's officially time to welcome the newest flavor. The product showed up on the Walmart website which restarted the buzz about the flavor. Although they aren't available for shipping or pick-up yet, they're expecting to appear in stores across the country. Despite this, some Walmart locations have already begun to stock the shelves with the Oreos. Nabisco decided to go pink instead of the classic yellow that Peeps typically appear as. The cookie itself is the usual vanilla flavor that is used in many of their cookies, but the filling is where the Peeps marshmallow flavor can be found. Last year, the s'mores-flavored Oreo was released with marshmallow filling as well. 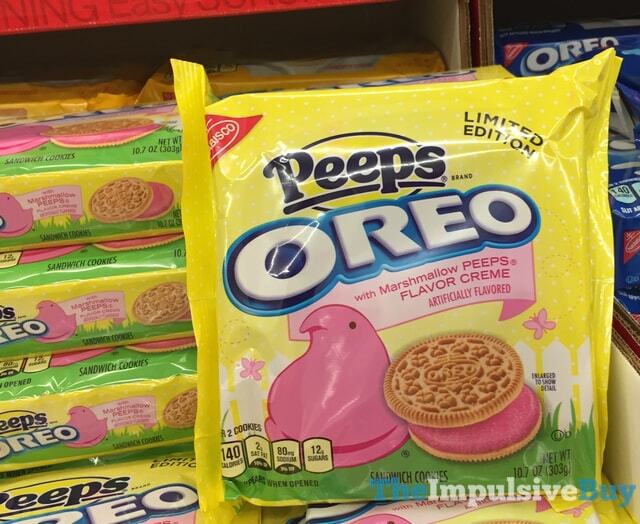 While the Peeps style may taste different, it's not a whole new concept for Nabisco. Does this version actually taste like Peeps? That's up for you to decide for yourself. Cruise by your local Walmart on the 22nd to snag a pack and give it a try. Hopefully they taste better than the Swedish Fish Oreos did, but there's only one way to find out. If they're a hit, these Oreos might even be showing up in your Easter basket this year.